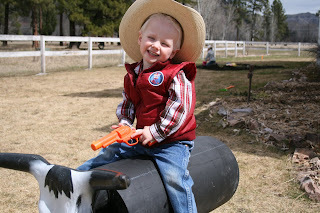 Back in the Spring my son turned three. We decided he was old enough to appreciate a birthday party, so we threw him his first one. 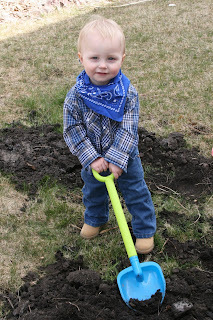 Since it was his first real birthday party ever I wanted to make it big & special. We had a ton of people over & the day was full of busyness. 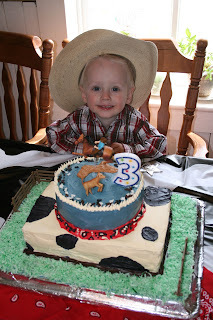 My boy is absolutely obsessed with cowboys, go figure, so of course he wanted a cowboy party. 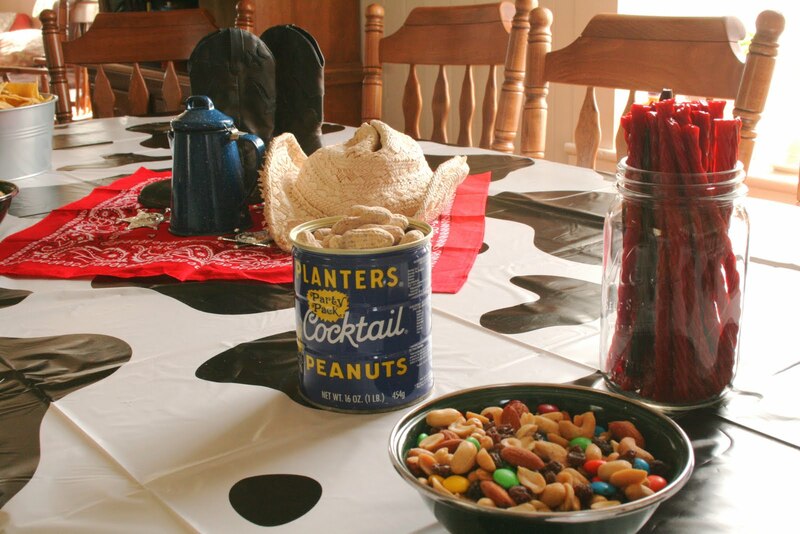 I found it increasingly hard to get affordable cowboy party ideas, I waded through tons of websites. 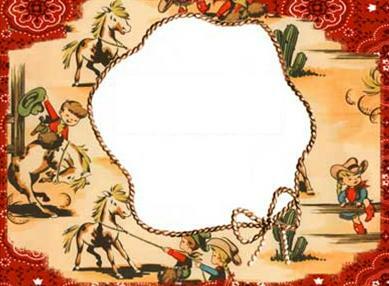 So I compiled some ideas & pictures here for you in case you have a little buckaroo's party to throw. First the cake. This is one of the things I really wanted to do up. I made two 9 by 13 inch white cake layers with chocolate in between & two 9 inch chocolate cake layers with raspberry in between. I froze the cake layers before I started assembling it. This made them easy to trim & work with. I frosted the bottom layer with white first & then outlined the black print with a frosting bag. I filled in the black area using a knife. The top layer was frosted all denim blue & then I put white star shapes around the top. I made a red stripe around the middle using my frosting bag & then decorated it with whit & black shapes like a bandanna. 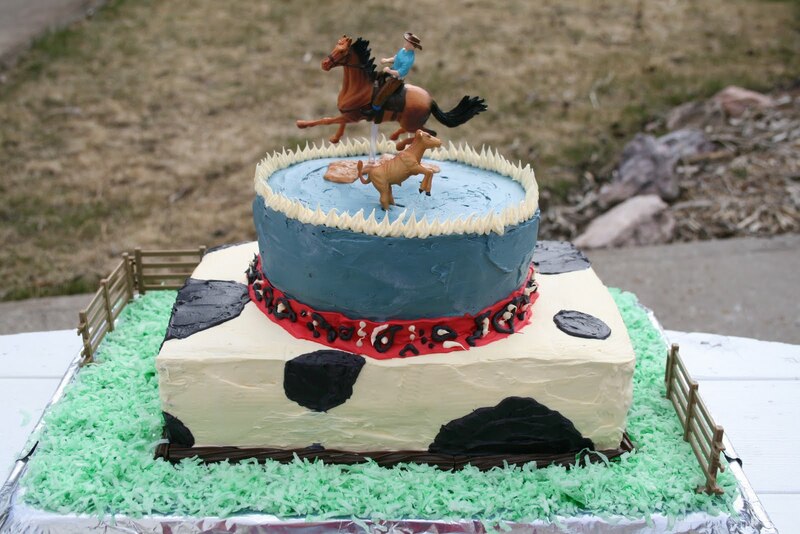 Green dyed coconut made the "grass" around the entire cake & chocolate licorice is the rope around the base. A toy cowboy & calf adorn the top & the fence pieces are also toys. Guests were asked to where their cowboy gear & I placed extra stuff I had on the porch for anyone who needed more accessorizing. 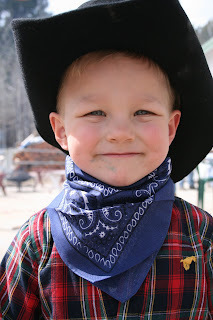 Each kiddo received a bandanna upon entering the party. I got bandannas real cheap from Oriental Trading Company. 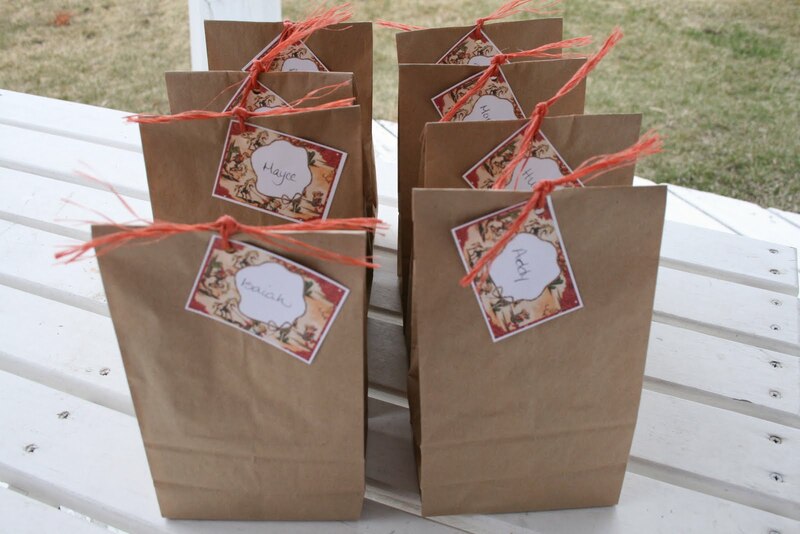 Party favors were put in brown paper lunch bags & tied with a piece of bailing twine. 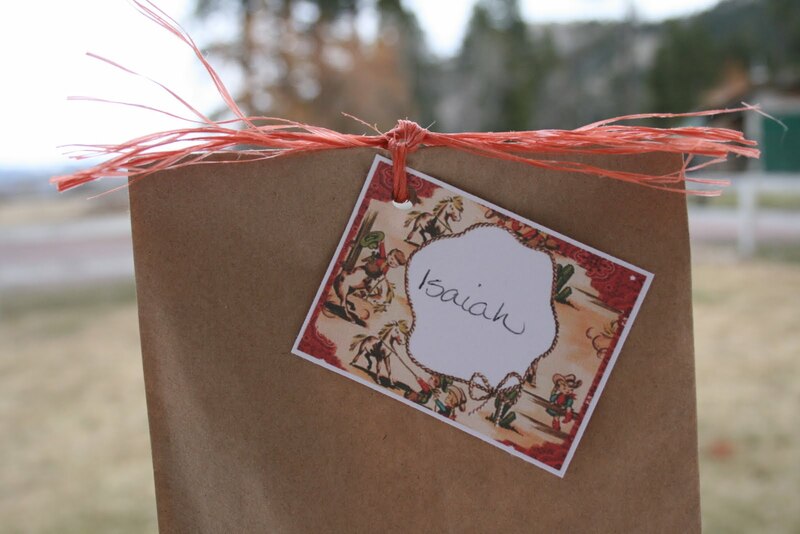 Bags were filled with a sheriffs badge, gold coin gum, a piece of fruit leather, a toy plastic horse, mini cowboy notepad, Hershey's Gold Nuggets candy, and a cowboy magnet craft. I got most of this stuff from Oriental Trading Company, they are a great resource for parties! 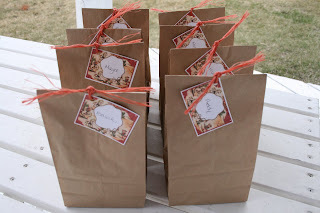 The name tags I found in Google images. I printed them off in business card size & then hand wrote each child's name on it. We had a pile of dirt in the yard to fill in some holes. I hadn't gotten to this landscaping project before the party so I just threw some kid shovels, rakes & buckets on the pile. It was a big hit. 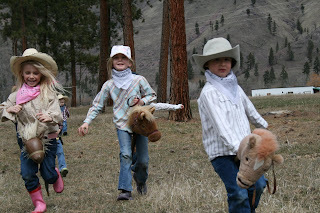 We had stick horse races. 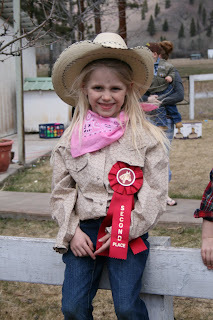 And at the end each rider won a ribbon. We have buckets of these from horse shows, but I be you could find generic ones online. 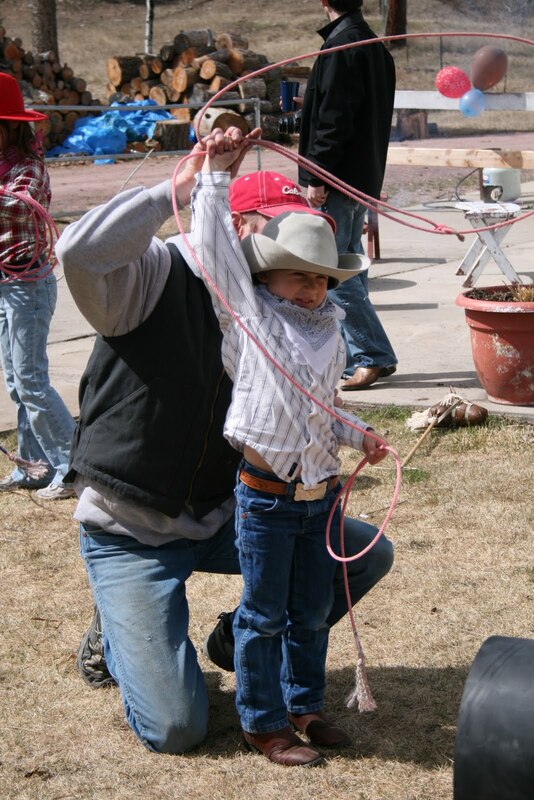 Our friend is a team roper so he brought out his ropes & roping dummy & gave all the buckaroos a lesson. The kids loved it! And when the dummy was being used for roping it made a great bull for riding. 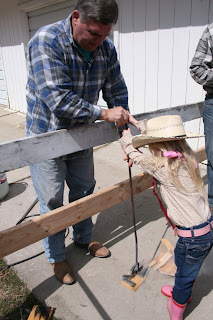 There was a branding lesson as well, & each kid got to take home a block of wood that they branded themselves. 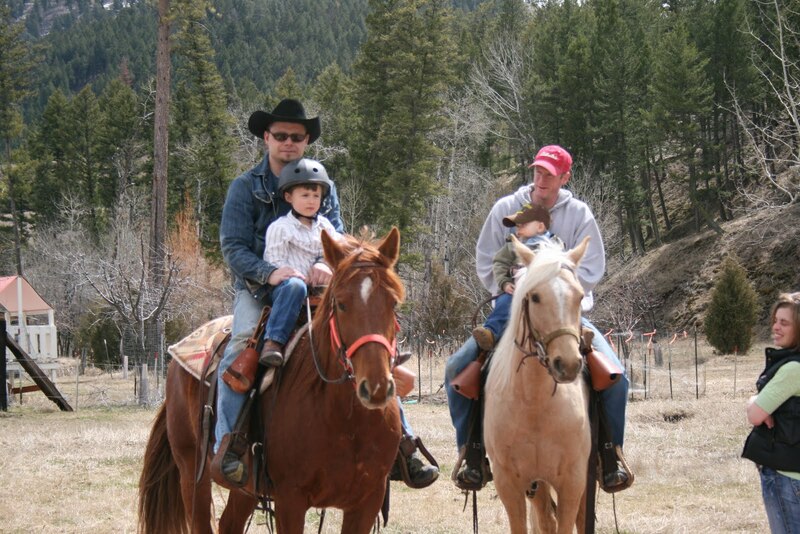 Of course there were horseback rides. 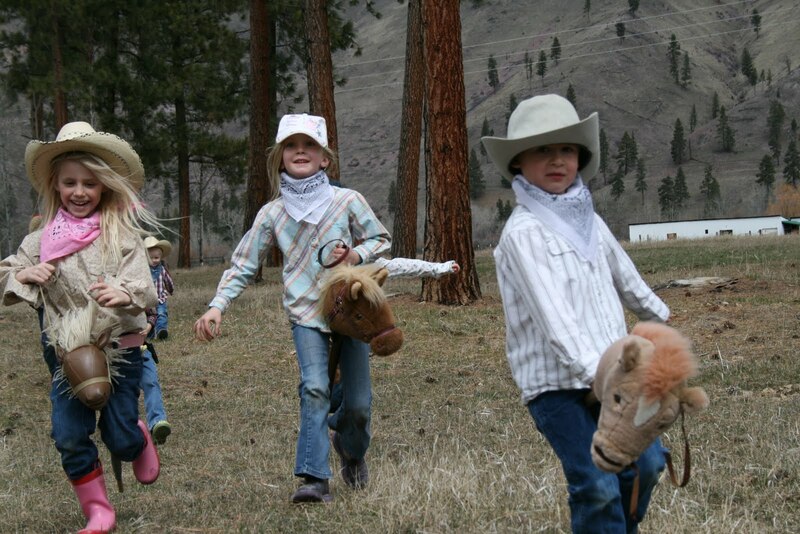 And we played Hunt in the Hay. Coming from a long line of dairy farmers & ranchers this game was a staple kid game at our family reunions. 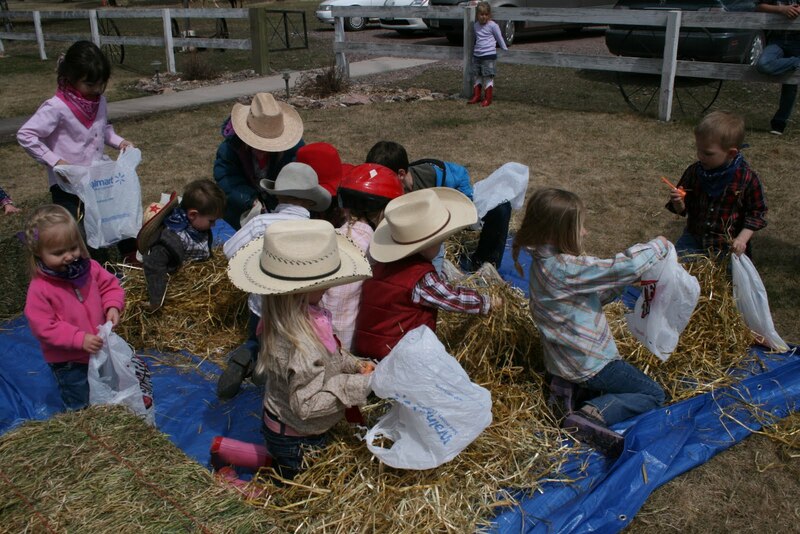 Basically you take a bale of hay & break it up & then hide a bunch of goodies like little toys, candy, & such. On three all the kiddos run to the pile of hay & dig through to find whatever treasures they can. It's kind of like a western version of the pinata. For grub I put out snacks in metal camping dishes & mason jars. There was trail mix, licorice, chips & salsa, & peanuts (still in their shell of course). For lunch I served pulled pork sliders, baked beans, coleslaw, & homemade mac & cheese. I got great cups, plates, & table clothes from Birthday Direct. I used outgrown cowboy boots, hats & bandannas to decorate with. I folded bandannas in half & tied the ends together to make a cowboy banner across the front porch. Hope this helps in your party planning endeavors. Cowboy up! Amazing cowboy birthday party. You really did a great job in arranging this. Seriously loved all arrangements. Couple of days back I too arranged my nephew’s birthday party at one of Venues in San Francisco. I went with power rangers theme as he loves it. Was able to arrange grand party with best ideas from internet. Hey, I'm Jess! Montana native, wife of one, mother of five, artist, gardener, and country girl. 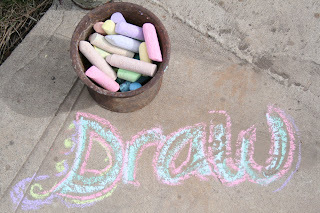 I started this blog as a way to share and save my recipes and ideas, mostly for my children. Hope you find some good and easy homemade dishes to enjoy and maybe and idea or two for your home. Thanks for stopping by! 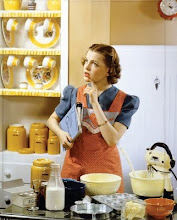 Stumped about what to make for dinner tonight? Grab some recipes ideas from the Mixing Bowl.